Hot air frying using the low fat air fryer is getting more popular judging from the many social media sites offering cooking tips and sharing of recipes. Philips hot air fryers have a lot of fans exchanging recipes at these social sites. One of the common comment seems to be the small size of the 1.8 pounds cooking basket of both the manual as well as the digital version of its first model released to USA consumers in 2010. The larger capacity 2.6 pounds model was later released to cater to those with larger families and those who need to cook more than what was offered in the 1.8 pounds Philips HD9220 food fryer. So, do you need a larger capacity air fryer? 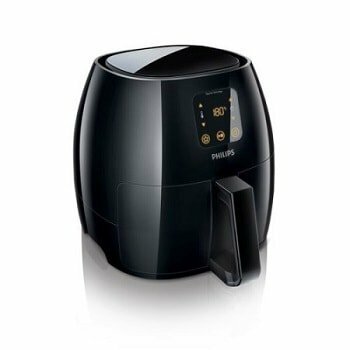 Check out my Philips avance xl air fryer review, it might just be the best hot air fryer for you. The XL model is available in black or white color. The Philips XL hot air fryer comes with a large 2.65 pound cooking capacity basket. You can roast a whole 3 pounds chicken in it easily. Compared to the Philips HD9220 model, this has an additional 50% extra capacity. The 2.65 pound capacity basket can easily cook enough for a family of 5. You are able to cook 7 – 8 chicken drumsticks at one go or about 1.5 pounds (4 – 5) portions of French fries. Its cooking capacity is something like a small convection oven but food cooks faster in the fryer. The air fryer heats up in just 3 minutes whereas the oven needs 10 minutes. No separator is provided with this XL version which means that if you wish to cook 2 different food items, you’ll have to put them together or cook them in separate batches. Fish and fries or chicken and fries can be cooked together but do take note of the different cooking times. However, cooking this way reduces the portions available. Using its patented unique Rapid Air Technology, the XL Avance hot air fryer by Philips is great for any type of fried food for children. French fries, nuggets, fish fingers, jacket potatoes etc. come out tasting like those deep fried but without the grease. Using rapidly moving hot air to cook, you get to taste the food and not the oil. 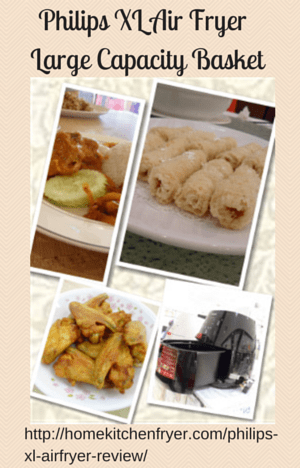 Oven cooked foods and snacks that kids love can be cooked faster in the hot air deep fryer. Fries, chicken nuggets and potato wedges can be cooked in under 15 minutes with a nice brown color and a crispy texture. Timing is important for the perfect crispness. Jacket potatoes take about 20 minutes. Your 7 – 8 chicken thighs get cooked in about 20 – 25 minutes. Keep experimenting to come up with the perfect recipes for your family. The hot air food fryer is highly versatile and involves more than just fries. Lovely succulent chicken is what you can get with this versatile hot air multi cooker. Meatballs take about 8 minutes. You can even make more and freeze them for other days. Just reheat them in the air fryer. You can toast frozen bread. It can even replace your sandwich maker. The tip is not to pack too much food in the basket. Just a single layer with the food items fully exposed to the hot air would be just nice. Only smaller cuts such as French fries can be piled on top of each other. For these, you need to shake the food halfway through cooking. You’ll be delighted to see the amount of oil dripped out from the meat during cooking. All these fat would have ended up inside you. Hot air cooking is the way to go if you wish for less fat in your diet. According to Philips, air fried fries contain 80% less fat compared to those done in a deep fat fryer. Homemade fries contain as little as 1.5% fat content. The airfryer comes with a recipe booklet with 30 recipes to get you started. Searching through the Internet provides even more tried and tested recipes by consumers themselves. Digital display can be clearly viewed and easy to use, featuring a 60-minute timer, integrated Power-on light, on/off switch, preset cooking function as well as time and temperature control. Setting the temperature and timer is really simple with the intuitive digital touchscreen interface. It just takes 3 minutes to reach the temperature you set. 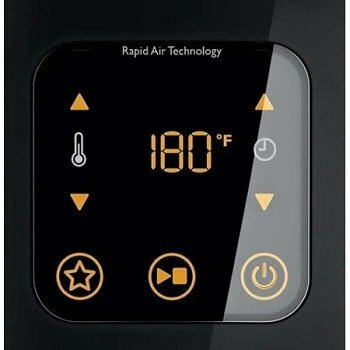 The appliance comes with an adjustable temperature from 150 degrees to 390 degrees F. It goes up in increments of 30 degrees. Maximum for timer is 60 minutes and you’ll hear a ready signal when cooking is done. Use its Smart Preset button to save the settings for dishes you cook regularly. The sides of the appliance can get hot during cooking. This is due to the high heat from inside the fryer radiating to the outside walls. So do be careful when using it and avoid touching the walls of the hot fryer. It comes with a removable nonstick coated drawer and the mesh metal food basket which are dishwasher safe. Besides the specially designed Philips air fryer accessories, they also recommend getting round (8 inches) oven-proof dishes to be used in the fryer for more cooking options. Just like the smaller capacity fryer, the XL air fryer does have their own specially designed accessories. However, do take note that you have to buy them separately. 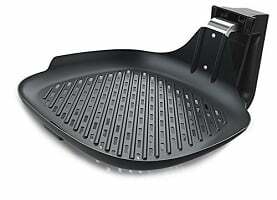 This grill pan is similar to the smaller size pan in features and function. Measuring 13.6 x 6.2 x 8.9 inches and weighing 1.4 pounds, you can use it to grill, roast or air fry your tasty steak, vegetables etc. The perforated base ensures a good air flow thus allowing more even grilling. It also allows excess oil to drip out easily. Due to its maximized surface compared to the cooking basket, you can cook a more generous portion of food. Most customers commented that it is easier to clean compared to the cooking basket. It has a non stick surface and is dishwasher safe. This is an optional purchase. 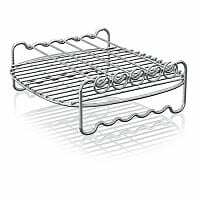 The double layer rack comes with a set of skewers for grilling kebabs. With this rack, you can cook more at the same time as the rack creates another cooking surface for putting your food ingredients. For example, you can have meat patties on the rack with French fries in the basket below. Measuring 7.9 x 3 x 7.9 inches, this rack is dishwasher safe. There is no baking dish specially designed for the XL model yet. However, you can actually use the baking dish for the smaller size fryer in your XL model. It will definitely fit into the 2.6 pounds cooking basket. The Philips baking dish comes with a handle which makes removing it from the hot fryer easy. Or you can use other oven-proof dishes such as Pyrex for more cooking options. 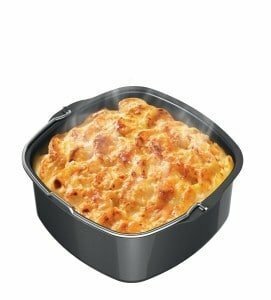 Taking these hot oven-proof dishes out need more care as these do not come with handles like the Philips baking dish. You’ll need oven mittens or tongs. You might like to get another basket so that you can cook something else immediately after one batch is done. Besides those specially designed for the Philips brand of air fryers, you can also use other air fryer accessories brand. As long as these can fit into the fryer basket, then you can use them. These are truly useful air fryer accessories that will bring fun and creativity into your cooking. This air fryer baking pan measures 6.3″ in diameter. The pan has a depth of about 3″. Cleaning is easy as it comes with a non-stick coating. It is great for baking cakes, recipes with sauces, soups, omelets, curries and lots more. It’s certainly easier to clean compared to the basket. The whole set includes 1 cake barrel, 1 Pizza pan, 1 metal holder, 1 multi-purpose rack with skewers and 1 silicone mat. With this set, you can greatly expand your cooking options in the air fryer. 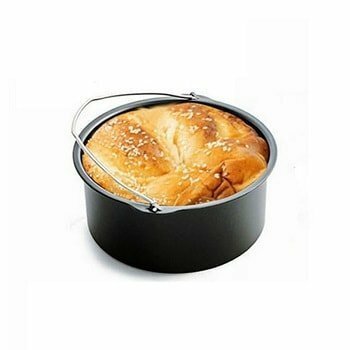 Bake your cake, bread in the non-stick cake barrel. 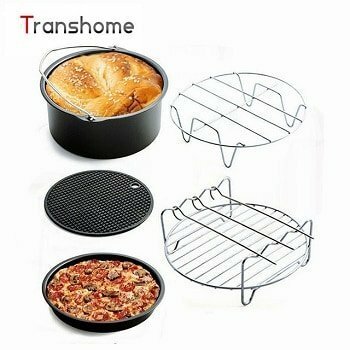 Use the pizza pan for pizzas, steaks, eggs, pancakes, hamburgers etc. Metal holder/rack allows for a second layer of cooking. You can cook more at the same time. With the skewers, kebabs are super easy now. Any food that you can fry in a frying pan can be cooked in the air fryer. All the items can be cleaned in the dishwasher. Accessories need to be bought separately. If you need to cook large portions then this Philips XL hot air appliance is a good choice among the hot air cookers in the market. Their standard model with the 1.8 pounds capacity is already very well received and consumers have shared lots of recipes online done successfully with the smaller Philips airfryer. 50% more capacity and 30% faster cooking compared to the smaller model, this XL model with the higher wattage would easily meet the needs of a family of 5 or 6. Check out the video below showing the XL fryer cooking meatballs enough for a large family. This appliance would be great if you stay in a small apartment with limited kitchen space and no kitchen hood. There is no lingering smell like those from a deep fryer. A healthier and cleaner way to deep fry using hot moving air, you can also bake, grill and roast in the hot air fryer, saves on having a number of separate cooking appliances. You can cook small amounts of food, which is not so practical with the oven. This hot air frying machine is great for snacks. 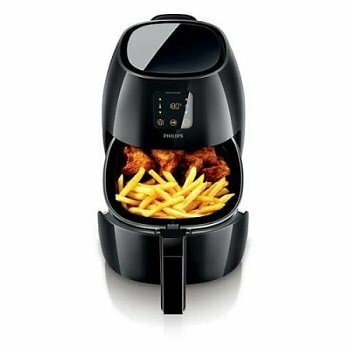 This black air fryer with the glossy finish is easy to use. Fuss free healthy cooking with good results is a great attractive appeal. I’m sure you’ll enjoy trying out new recipes in your large capacity cooking basket Philips air fryer XL. There are some who even took it with them when camping. It is a very useful piece of modern kitchen appliance. This Philips healthy fryer would be great for you if you love fried food but minus the fat. Yes, it is easy to use, food is tasty and has the crispy texture and cooking is fast. It is a low fat fryer as well as a multi cooker. You can cook many types of food in this food fryer. You can even bake cakes. The grill, fan and the starfish design on the bottom of the Philips XL Airfryer contribute towards rapid heated air circulation for even and fast cooking.